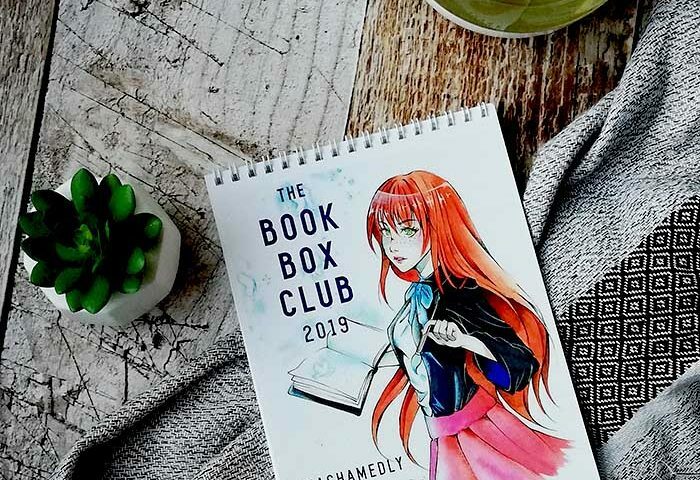 In 2018, we held a competition looking for talented illustrators to help us create a calendar inspired by favourite books and what it means to be bookish. We were overwhelmed by the brilliance of the entries and spent hours pondering how we were ever going to pick twelve winners from such an amazing array of artists. So… we picked 13 instead! We shared these winning artworks with our lovely members by including The Book Box Club Unashamedly Bookish Calendar for 2019 in our December box (and there are a few copies left in our shop if you’d like to buy one!). Now we are thrilled to showcase the work of these very talented arty individuals and we would like to thank everyone for entering and sharing your bookish art with us. Sandra is a freelance illustrator who loves recreating woodland creatures (particularly foxes!) in pretty pastel colours. She is also the creator of online shop Four Seasons Fox. Find more of Sandra’s artwork on Instagram: @fourseasonsfox & her website: www.fourseasonfox.com. Luki from Singapore founded bookish merchandise shop The Twinkle Canvas in 2017. She sells gorgeous items inspired by some of her favourite reads. Find more of Luki’s artwork on Instagram: @thetwinklecanvas, Etsy: www.etsy.com/sg-en/shop/Thetwinklecanvas, Society 6: www.society6.com/twinklecanvas & RedBubble: www.redbubble.com/people/twinkle-canvas. Velbe (Beatrice Joy B. Velasco) is a freelance illustrator and writer from the Philippines. She graduated from University with a degree in Creative Writing. On the side, she found a new way of telling stories through traditional visual arts. Find more of Beatrice’s artwork on Instagram: @velbe_. Italian trainee neurobiologist Mariateresa has a great passion for art, comics and all things illustration. She is always searching for new ways to be creative! Find more of Mariateresa’s artwork on her website: https://rimatesa91.portfoliobox.net, Instagram: @rimatesa91, Society 6: www.society6.com/rimatesa91, Behance: www.behance.net/mariateres47d5 & Pinterest: www.pinterest.it/mariateresa5752. Laura has a degree in animation but by day she is a librarian! She loves to create illustrations, zines and comics. Find more of Laura’s artwork on Instagram: @illustration.by.laura. Dena is from Vienna and is currently studying piano and music pedagogy. Besides music, she loves to draw, read, write and play computer games. Her artwork style combines ink and watercolour with fine details. Find more of Dena’s artwork on Instagram: @poroline_, Etsy: www.etsy.com/shop/PorolineMakes & YouTube:goo.gl/G26s9F. Nova is 23 years old and is from a big family of artists. She is self-taught and has been drawing ever since she could hold a pencil. Her hobbies include reading (especially Harry Potter), playing video games, making clay creations, and playing Taiko. Find more of Nova’s artwork on Instagram: @thetravelingsketchbook. Alícia Jo is an aspiring visual development artist in the animation field. She works as a freelance artist in Barcelona. Drawing has been her passion for as long as she can remember. Find more of Alícia Jo’s artwork on Instagram: @aliciajoart. Melody is a 23 year-old self-taught, Harry Potter-obsessed artist who loves drawing, reading and watching the Great British Bake Off! Find more of Melody’s artwork on Instagram: @theimaginativeillustrator. Aurora is a 16-year-old bookworm, avid sketchbook keeper and Art and Design student from Cornwall in the UK. One day she’d love to be a children’s book illustrator. Find more of Aurora’s artwork on Instagram: @aurora_rose_art. Hattie is a UK-based illustrator who works mostly with ink and watercolours. She has always been an avid reader with an overactive imagination and loves translating the images in her head onto paper. Find more of Hattie’s artwork on her website: www.walkingonthecurb.com & on Instagram: @hattiehyderillustration. A big thank you goes out to all of our winners. You are FANTASTIC! We hope that you’ve all had wonderful weekends!